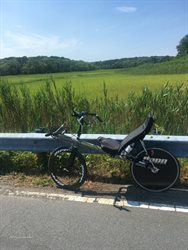 My Ti Aero took me on a 22 mile ride through my new neighborhood just north of Boston. 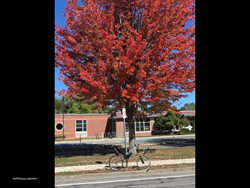 Foliage is spotty this year, but, found this colorful tree. Hi Chuck, I'm still at it on the same bike. Just bought a condo in Reading, so, I'm learning knew roads. Joined the North Shore Cyclist. Will start riding with them soon. Still learning the streets in my new neighborhood just north of Boston. 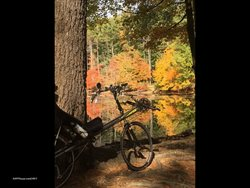 Did a nice 30 mile loop and found this nice spot for a picture of the fall foliage. 18 kms up an inclined nice country road to a nasty end dip down to a river. After dealing with that, an attempt to be 'not worst' on a Strava segment on the way back. Mission accomplished even with a stiff wind blowing into my face. Given a fair wind, mid pack beckons. I know it doesn't matter but the segment chasing helps me, as a solo rider, to stay focused. 22 Freedom Miles or 36 kms in total. For my 47th anniversary, I did a nice 47 mile ride around Cape Cod. 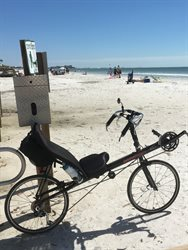 Getting ready for the Hospice Charity Ride with you, and a NEW charity ride for my grandson Alex who has type 1 diabetes. Go Bernie. Donation on the way. Had a lot of fun doing my third ODRAM, One Day Ride Across Michigan, yesterday on my Carbon Aero. Impressive average speed and low average heart rate! Thanks! 41 years of running have given me a resting heart rate in the mid to upper 40's at age 62. ODRAM is one of my favorite events. Great route and an extremely well run event. And not too big. About 400-500 riders. Great ride in a beautiful place with perfect weather! Northern Michigan. Petoskey to Mackinaw City through the "Tunnel Of Trees" on M-119. Turn around at the Mackinac Bridge. Did a side trip to Wilderness State Park to make sure I would be over 100 miles. Then retraced my route back to Petoskey. Almost no traffic and only saw two other bikes all day. My wife and I will be in this biking paradise with a great weather forecast for another week! Did the Tour de Livingston bike ride today in Michigan. Perfect weather for 106 miles. Lots of fall colors and great scenery throughout the course. Loved riding around the GM test track at Milford Proving Grounds. Probably my last big ride of the year. But, I now have 12 centuries for the year, my most ever. And I am closing in on my all time mileage record of 6821. As of today I've ridden 6221 miles in 2017. Also on the Relive website, but I entered the wrong year and Relive does not allow re-edits unless you are on their paid plan. But still, it's pretty cool to see your rides like this. Luckily I’m vacationing in Florida while a mega nor’easter is hammering Cape Cod. 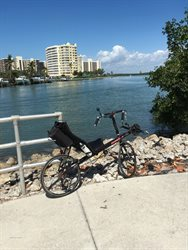 Today I did a nice ride through Naples on my Corsa 24. While Cape Cod gets hammered with its third Nor’Easter in March, I’m enjoying the Florida roads.